Changes have been made to two city footpaths after the death of a cyclist who fell down a set of steps. 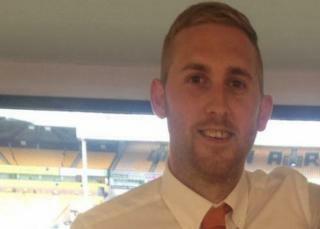 Warren Dowling, 32, crashed while cycling home down The Loke, Norwich on his way home at 00:18 BST on 28 May. An inquest heard the path was poorly lit, and the steps could not be seen before they were approached. Inspections were carried out at other similar sites after a call by coroner Yvonne Blake "to stop anyone from catapulting down there too". At the inquest, Ms Blake said Mr Dowling died at the scene from multiple traumatic head injuries after falling down steep steps while on a bicycle and having consumed alcohol. Inspections were carried out at four other sites by Norwich City Council and Norfolk County Council between 16:30 and 17:45 GMT on 13 December in "dark conditions" to "assess the level of cyclist/pedestrian risk". The subsequent safety review recommended two bollards were installed on a path between Burges Road and Mile Cross Road to prevent cyclists reaching the steps "at speed". The path was found to be well-lit but summer foliage could reduce visibility, the report said. A staggered barrier on a narrow path between Heathgate and Mousehold Street was said to deter cyclists but foliage should be cut to "to improve illumination of the steps". No changes were needed to paths between Soleme Road and Drayton Road, and Burges Road and Drayton Road, the review said, as both were well-lit and had effective measures to prevent cycling at speed.